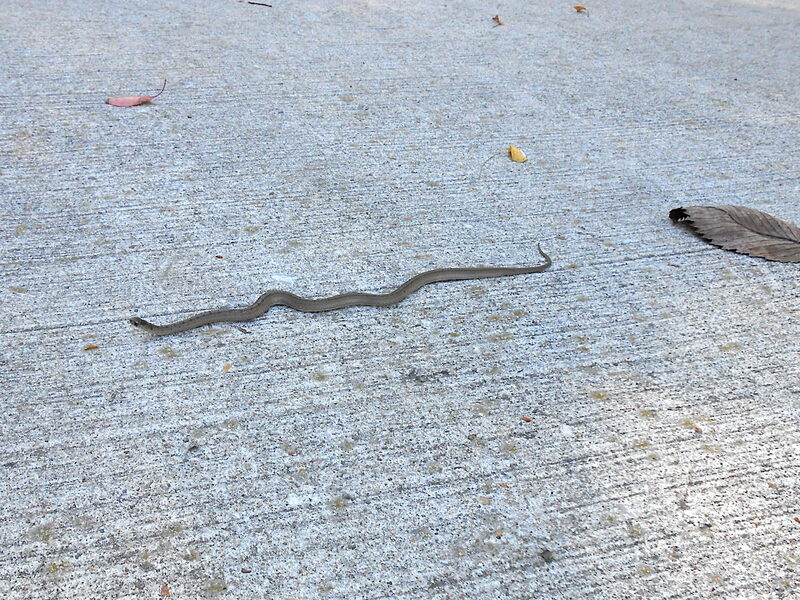 Snakes on a … Sidewalk! Most snakes in Iowa are pretty harmless, not scary like snakes on a plane. The ones we see most often are non-venomous and pretty amusing. They are Brown Snakes, and they typically measure from 13-18″ long. Most we see in our neighborhood are smaller than that, with lengths from about 8-12″. 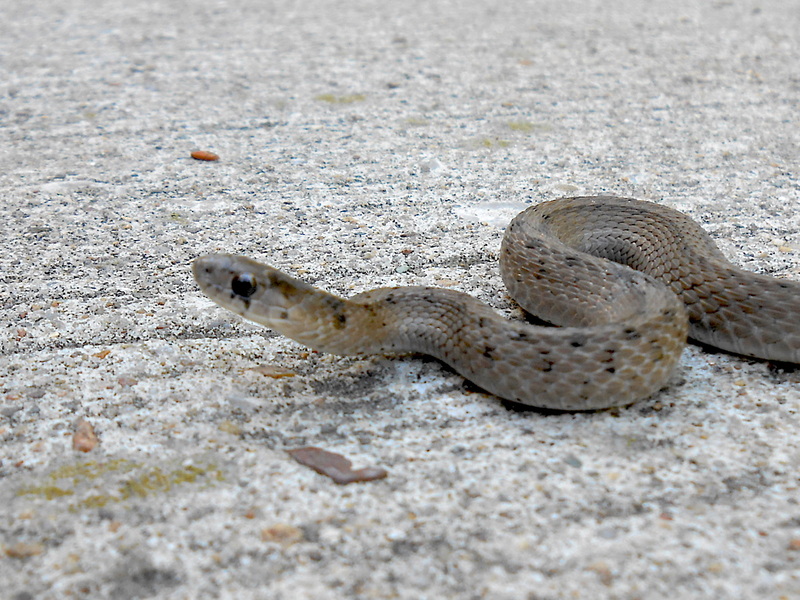 Yesterday’s first snake sighting was on the paved trail behind our house. We had just left the house for a short walk when we happened on the snake, stretched almost its full length across the trail. We estimated it was about a foot long, maybe slightly more. There was some dappled sunlight warming the little thing. They seem to appear in early fall. They like areas with water and some woodland border, making our neighborhood the perfect habitat. Jim ran back to the house to get a camera while Melanie stood guard. Two women came along and admired it while we waited. They said there were other snakes that were much smaller farther along. 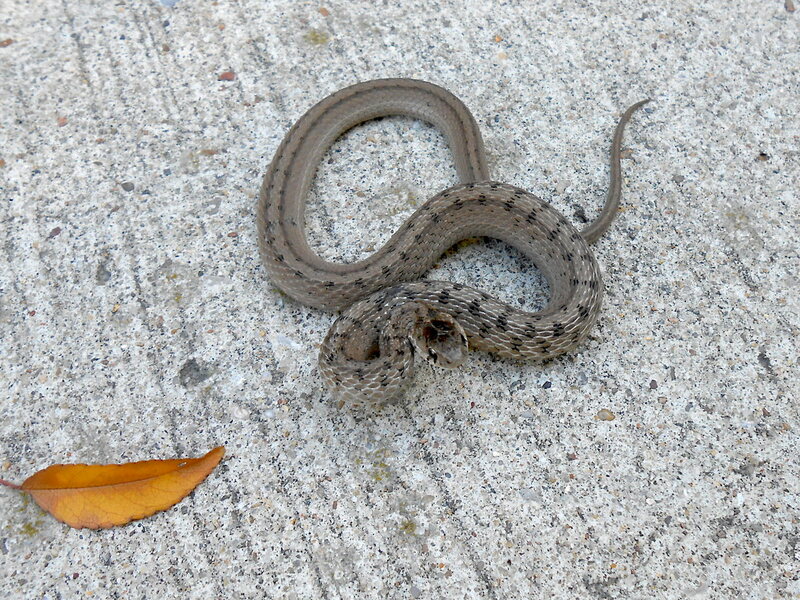 And then one of the women hopped a little and pointed to two more snakes at the edge of the sidewalk. A bicyclist rode by, and we directed him to the side so he wouldn’t run over the small monster. Finally Jim came back, camera in hand. Slightly out of focus, its tongue is flicking at high speed. Great picture of its markings, including the top of its head. With no sense of scale, you might think this is large and ferocious! A few seconds of video, with Melanie’s finger to show how tiny it is. After that encounter, and noting the two other snakes at the edge of the sidewalk, we didn’t see any more for most of our walk. Shortly before getting home, Melanie saw another skedaddle into the grass. It was a larger, longer snake and moved very quickly. It moved too fast to get a good look at it, but because of its larger size, we guess it may have been a garter snake. Snakes are always fun to see around here, partly because we know they are harmless if not bothered. 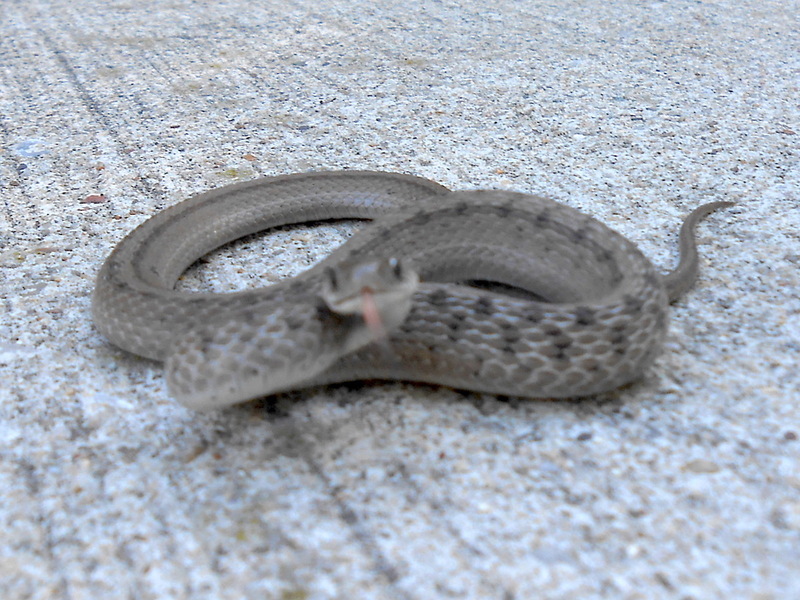 Do you encounter snakes where you live? This entry was posted in Backyard, Nature, Outdoors and tagged Brown snake, Neighborhood, Snake on October 9, 2017 by Melanie McNeil. Adorable! On my bike ride through Terry Trueblood yesterday, I encountered an older couple on the trail who were safeguarding a dinner-plate-sized turtle in the same way. I wish now that I’d stopped to snap a photo. But your mini-snake was far more entertaining. Thanks for posting and happy Fall! Happy fall to you! Thanks for reading and commenting. We should plan to get together soon. I found one in our garden. It may have been an adder (european viper), but I couldn’t be sure. Hi Steve. I’m glad I look in the spam folder occasionally. This was there, for whatever reason! Wiki says the European viper is venomous but not aggressive or especially dangerous. I’m not sure I’d work hard at IDing it, if it will only bite when bothered! Thanks. Too many people are unfairly prejudiced against snakes! Most of them don’t want anything to do with us humans. We have mostly garter snakes, occasionally a milk snake and rarely a black rat snake, which like to hang around silos. Thankfully, I’ve never run into rattlesnakes that are making a comeback on the mountain ridges. A man got bit by one last year (he stupidly handled the darn thing!) – another Darwin award. Ah yes…the Darwin Award. There are so many candidates. When we entered Yellowstone in June, we were handed several sheets of paper each saying (paraphrasing here) Don’t Be Stupid! Hi Jim, we run across a snake or two once or twice a week when out on our morning run. Mostly Garter and sometimes Bull snakes. Every so often we run across a rattler and mostly in the morning sunning themselves on the trail. I assume the rattlers ignore you if you just keep going? We do have rattlesnakes in Iowa but they are rare, and not something I’ll ever worry about. Hi, yes most of the timer rattles leave you alone but I have have had a few surprise run ins with them over the years and they were moments I still remember. Last week, with the full moon and a strong east wind, the tides were exceptionally high, and covered the dock I had to traverse to get to the boat I was working on. There was a nice-sized water snake on the dock, just lazing about. I’m not sure which species it was, but it was about two feet long. They’re pretty easy to distinguish from a cottonmouth, which would have sent me in the other direction, lickety-split. We have lots of snakes, mostly grass snakes and racer snakes which keep the rodents under control. Rick, who screams like a girl when he sees a snake has over time learned to live peacefully with them. When I lived in California we had lots of rattlesnakes. As long as you don’t threaten them, they are fine. Oh, I would scream at that! Just recently I jumped when another blogger had an animation to the right of the text of a parachuter which started out small, dropping from the top of the screen and then the parachute opens. At first, I thought it was a spider on my screen running toward my fingers and than I saw the parachute open…eek!